great elimination final win. Photo: Jamie Hill. DERWENT Valley teams playing in the Southern Cricket Association finals had a good weekend, with all but one side getting a victory. 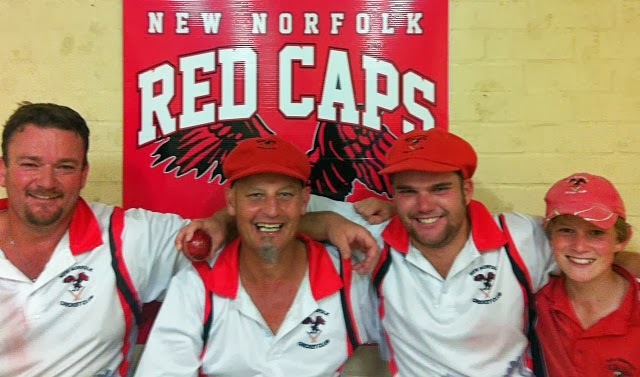 In the do-or-die Fifth Grade elimination final, New Norfolk II crushed its opposition in emphatic style. First they hit-up the good total of 201 with some good batting from Brendan Skelly (64) and captain Stephen Nichols (40), with both hitting five fours and a six. The Red Caps then went about dismantling the McRobies Gully batting order. Medium-pacers Josh Walsh (6-13) and Brad Kemmler (4-19) sapped the Blowflies for just 32 runs. The first four batsmen all failed to score and the rest weren't much better. At one stage they were 9 for 15. The wickets fell like ninepins - FOW 0, 0, 2, 8, 9, 11, 11, 11, 15, 32. Another highlight was the last-wicket stand of 41 between Brendan Skelly and 13-year-old Nathan Rice. This was a great effort, in particular by young Nathan who continues to impress. Molesworth I booked a 2nd Semi-Final showdown with arch rivals New Norfolk I after a 45-run win over Montagu Bay at Boyer Oval. Molesworth had first hit, making 10 for 179. The Adams Brothers Jamie (42) and Daniel (25) were the top run-getters. In reply Montagu Bay made a good go of it only to be bowled out for 134 due to some great bowling from the in-form Mathew Smith who took 4-21 and captain Brad Coppleman's 3-16. Molesworth now faces off with New Norfolk I for a spot in the grand final. In the Second Grade elimination final, Gretna I turned around its recent their bad form with a 92-run win over Richmond/Cambridge. Gretna had first hit, making the very good score of 8-277. It was an all-round effort with the bat, with all but two making double-figure scores. Mathew Burns hit some nice boundaries in his top score of 47 while Aaron Maddox continued to show good form with 40. Mathew Eyles kept things together in the middle order with 36 while Corey Ransley hit the ball very well for a valuable 34 not out. In reply the home team got off to a solid start, but as the Gretna bowlers continued to apply the pressure they were bowled out for 185. Matthew Eyles (4-54) and Aaron Maddox (2-34) made it a good day with the bat and ball while Daniel Browning did, well taking 2-37. Gretna now face Montagu Bay in the 1st Semi-Final. QUALIFYING FINAL: Molesworth I 10 for 179 off 49.1 overs (15 extras) d Montagu Bay 10 for 134 off 43.4 (14 extras) at Boyer Oval. Molesworth batting: J. Adams 42, D. Adams 25, B. Coppleman 24, C. Slater 20, N. Piuselli 15, M. Reggett 14. Molesworth I bowling: M. Smith 4-21 (10), B. Coppleman 3-16 (6.4), J. Adams 1-14 (10), B. Ransley 1-26 (7). ELIMINATION FINAL: Gretna I 8 for 277 off 50 overs (38 extras) d Richmond/Cambridge 10 for 185 off 39.2 overs (17 extras) at Richmond. Gretna I batting: M. Burns 47, A. Maddox 40, M. Eyles 36, C. Ransley 34no, B. Rainbird 29, D. Hack 22, T. Jarvis 17no, C. Cunningham 15. Gretna I bowling: M. Eyles 4-54 (10), A. Maddox 2-34 (9.2), D. Browning 2-37 (10), C. Ransley 1-27 (6). QUALIFYING FINAL: DOSA 5 for 319 off 50 overs (8 extras) d Gretna II 10 for 152 off 35.5 overs (7 extras) at Shoobridge Park. Gretna II batting: R. Browning 67, D. Pearce 20, A. Browning 18, T. Allcock 15. Gretna II bowling: R. Browning 2-35 (10), B. Nichols 2-63 (10). ELIMINATION FINAL: Knights 4 for 144 off 33.4 overs (19 extras) d Marquis Tigers 10 for 143 off 42.2 overs (8 extras) at Collinsvale. ELIMINATION FINAL: New Norfolk II 10 for 201 off 46.4 overs (24 extras) d McRobies Gully 10 for 32 off 13 overs (4 extras) at Tynwald Park. New Norfolk II batting: B. Skelly 64, S. Nichols 40, J. Browning 31, B. Kemmler 16. New Norfolk II bowling: J. Walsh 6-13 (7), B. Kemmler 4-19 (6). QUALIFYING FINAL: Lindisfarne 10 for 144 off 44.4 overs (29 extras) d Montagu Bay 10 for 91 off 30.2 overs (19 extras) at Geilston Bay.